Do you wan to got a green thumb? Or Want to connect with nature? Start a garden! The greenhouse is made of powder-coated steel frame in sturdy construction. It is lightweight but sturdy for long time use. Perfect to reduce excessive heat or cold and keep your seedlings and plants safe throughout the seasons in hot or cold temperature. The zipper door allows for easy access and ventilation while it also can be sealed in to maintain the internal climate. Durable frame allows easy mobility to change the location. The stacked design is ideal for a small gardens, deck, balcony or patio to allow you to increase the number of plants you can grow in one place. *Plants can live safely in very cold or hot weather and plants growing season will be extended. IDEAL FOR starting seedlings, protecting young plants or to get a head start or extend the plant growing season. 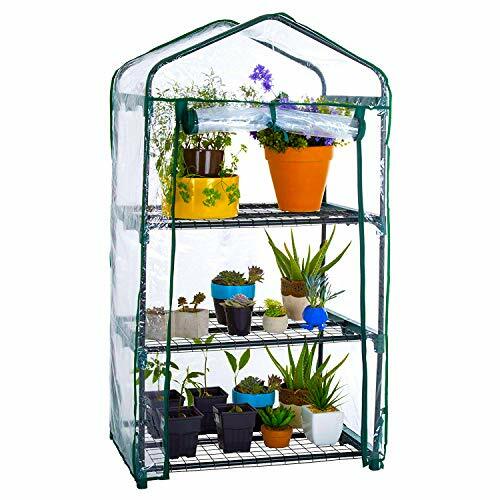 This versatile mini greenhouse is great for both indoor and outdoor use, keep it on your backyard patio, deck, basement, balcony, garage or your homes where space is an issue, helps protect seedlings from frost or pests for an ideal growing environment. EASY TO INSTALL: Strong push fit tubular steel frame assembles in minutes without any tools; No tools are required. STURDY CONSTRUCTION: High quality tubular steel with powder coated, heavy-duty bearing net on each layer can hold more plants, trays and pots. Clear polyethylene cover and zippered roll-up door for easy access and screened ventilation for optimum air circulation. WARRANTY: WZTO provides 45 Days Money Back, 1 Years Guarantee and Friendly, Easy-to-reach Support. Now purchase it and give your patios, balconies, decks and gardens a touch of green.Enjoying a lot of fun of the flowers and plants in your leisure time!